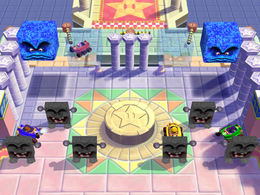 Tricky Tires is a 4-player minigame found in Mario Party 6. The view zooms from the end of the area to the beginning as the competitors appear. The main point of the game is to finish the course by guiding the car. Players must use front and back wheel to move the vehicle. 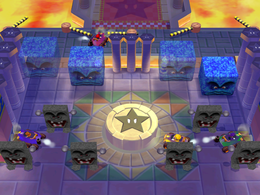 On the major portion of the area, there are Whomps, which obstruct players, and Thwomps, which temporarily squish players if they fall on them. Toward the end, there are moving yellow bars, which also obstruct the player. There are only aesthetic changes between the daytime and the nighttime. The stars become Ztars during the night, and the player's headlights are on. Additionally, beneath the final platform, the ground is covered in lava instead of tiles. The winner, who is standing outside their vehicle at the end of the track, performs their victory animation. Rules – "Avoid obstacles and race to the goal in your six-wheeled vehicle. Reach the goal first to win!" Advice – "Tilt and to steer your vehicle. Tilt both upwards to move forward." This page was last edited on December 5, 2017, at 00:12.